The Hours - My Memoir: Why Cinema? One of my many hobbies is to watch good cinema. I am a member of a film society who conduct workshops and film appreciation events. I enjoy cinema. Many people I know are sarcastic and ironic about this, reason to which I fail to understand. They ask me – Why do you watch so many movies? It’s a waste. I choose not to answer them. But there is always a reason, always an answer for what a person does in his life. Every hobby of mine, may it be traveling, photography, painting, gardening or writing; all have a reason and all have been equally criticized in the recent times. Movies, among these complete my other interests. When I watch a movie, I understand and like the script; I appreciate the locations, places they travel to; I observe the creative art involved in making the sets; I analyze the cinematography and directors point of view; I enjoy the music; I admire the performances. So in short, cinema is one package that captures, art, theater, photography, travel, writing, music, dance, technology, imagination and several other interests that man has had so far. The least I could say to impress the so called intellectuals is that it is an encyclopedia of general knowledge, not just what you see or know, but also of what humans feel and experience. May it be the artistic approach in “Vicky Christina Barcelona”, “Hum Dil De Chucke Sanam”; amazing locations in “The Beach”, “Motorcycle diaries”; Brilliant scripts such as “Doubt”, “Moksha” or “The Lesser Evil”; amazing performances in “A River runs through it”, “Dweepa” or “Page3”; Unpredictable twists in “Fight Club”, “Butterfly Effect”; Creative work in “Shrek”; or most natural portrayal of life in “Gulabi Talkies”, “Raincoat”, “Children of Heaven”; all have contributed to enrich my thoughts. A take away from the movie can be a philosophy handed over, as “The Hours” did to me. Cinema is vast; the level of creativity that can be achieved by them is, I think, Incapable by any other means. Technology and art go hand in hand. But as Virginia Woolf says – “Really I don't like human nature unless all candied over with art”. And then there are some, who say – I watch movie for just entertainment. That’s all I want from them. If you want to be, only a mere spectator and not an absorber of art, then so be it. But that’s not what everyone else should think dude! U have an eye for detail, y don't u persue your passion seriously? Anu - Thanks. Well I am lost. Which one to concentrate on? :-) Never got time for one hobby in particular. Lakshmi - Yes. Well this is Suchitra film society...Its in Banashankari...Yearly membership is Rs500. They conduct workshops and show good international cinema every every week. And youget to know about the festivals happening around on their news letter. Hello Ajeya, a very interesting post and all points were taken well. Now, I would say you have a very good collection of movies. Nevertheless I do fall into the “Movie fan Club” category. Today, I saw a movie called “Train to Pakistan”, do watch it if you have not seen already it. Alok - I havent. But heard of it. Will do. Ajeya, your viewpoint on the art of cinema is wonderful! You're right, most people enjoy it for entertainment value and that's ok. To each his own..as the saying goes. Most movies bring tears to my eyes..be it for joy, or sorrow..I really 'get into' the characters' emotions. And, of course, I appreciate the beauty of locations, too. Your film group sounds fun! Art, photography and now cinema! Wow, you are multi-spirited! I loved barcelona! I think it's Woody's best work. I don't think you need to be apologetic about your passion. People might not understand it. I have a lot of people asking me why I read so much. They won't understand it. It's the art side of life. You are a real lucky guy to be having so many passions. Work on them. Have fun. Kish- Yep Barcelona is too good, its very artistic. Ajai- True, I am not apologetic though...just that I dont understand people sometimes. End of the day, they dont matter...What do you read? It depends on the person's personality and interest. Generally, I avoid discussing about movies with those who think I'm over analyzing it. Dot - Very true, but i cant avoid the people over hearing conversations and interfering. Haha..ya the vCB review. I havent got time for that yet. 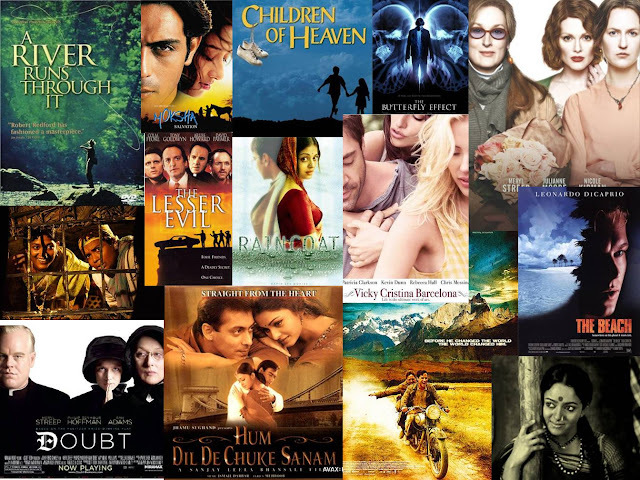 Though I am not a movie buff, lately I watched a few good movies too - both English and Hindi, some old, some new. Have you watched Linus Roache and Nandita Das' movie 'Before the Rains' shot in Kerala? Hello Celina...no i have not...will check these out. i guess intelligent people are interested in films and arts like u.
and ordinary people (like me) cannot sit down still and concentrate for a long time. that society sounds cool ajeya chan!! :-) Come on niki, i bet you have other hobbies that make you interesting person. Can anybody help me in getting the contacts for stay in Kodachadri. Bhatra House would be better if possible. Kumaresan - its Parameshwar Bhat - 08185-295934.....this was the number a year back. Should be the same still try out. Have fun! ajeya,depends on persons interest interesting blog,from your collection of movies i loved gran tarino. Hello Shah...IS this Sharath? Ya I liked Grand torino. Nice film,was very predictable though.